New research supports a thesis that makes us feel all warm and fuzzy inside – and that feeling itself is good for our health and longevity. People who seek gratification through personal aggrandizement and accumulation of wealth may achieve a kind of hedonistic satisfaction, but this leads to negative health consequences and shorter life span. Meanwhile, people who seek fulfillment through service, dedication to cooperative efforts and shared values tend to have better health and longer lives. The dominant theme of my research this last dozen years is that aging arose from an evolutionary conflict between that which is best for the individual and that which is best for the community. Best for the individual is to go on living and reproducing, the longer the better. Best for the ecosystem is to have a stable death rate to help avoid overpopulation, leading to collapse. Without aging, everyone would likely be dying at once in times of overcrowding and severe scarcity. Better is a fixed life span that stabilizes the population dynamics. Even better is an adaptive life span which rises and falls in such a way as to complement the cycles of “external” deaths from starvation and disease. Typically, life spans are not fixed, but plastic in response to environmental cues. Almost always we can find some communal benefit in the relationship between life span and external conditions. The best example is the Caloric Restriction effect, which is an adaptation to help protect the community from population collapse in times of famine. Aging also responds to other environmental challenges, and to crowding. Man is a social animal, and a significant piece of our evolution has occurred in the hundreds of thousands of years since primates began to live in structured social groups or tribes. That suggests we might expect our life span to depend on social factors. It is an effect worth looking for to see if leaders and important community members live longer than “disposable” rank-and-file workers. There is some indication this is true, including a new study this week that connects aging to the satisfaction derived from constructive engagement with the community. Thirty years ago, the British Whitehall Study first documented a relationship between mortality and status among civil servants. The British system ranks public employees in a detailed grading system. The mortality rate among men at the lowest grade was more than three times as high as the rate at the highest grade. Differences in mortality persisted into retirement, producing a marked effect of social station on life expectancy. The disparity was too large to be explained by differences in access to health care, or by the better self-care associated with education. Right up into the highest employment grades, status was a predictor of life expectancy. This suggests to me that we sense our importance in the community, and that our bodies respond by modulating our aging according to how much the community needs us. Marital status is another well-known link to longevity. “The unmarried live a relatively isolated existence that lacks the close interpersonal ties that the data suggest are a factor in maintaining a sense of well-being,” [Gove, 1973] and this translates into a mortality risk, larger for men than for women. 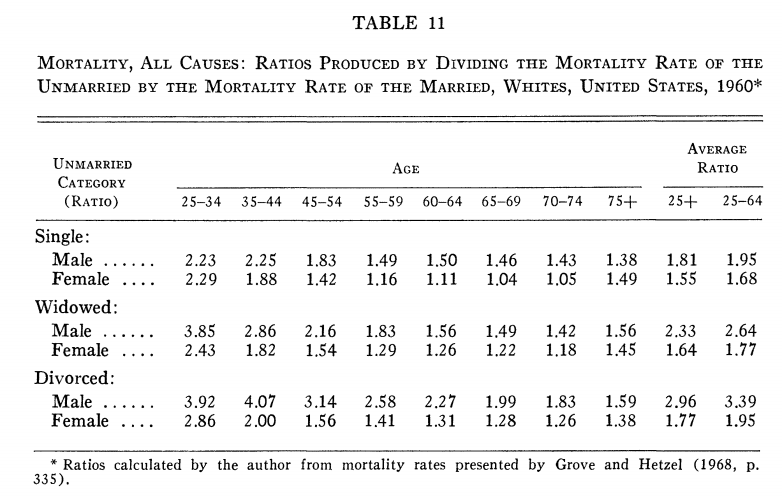 This table gives the mortality risk of various categories of unmarried people compared to married at different ages. The numbers translate to several years’ difference in life expectancy, just a little smaller than the difference associated with smoking status. Depression is a big risk factor for mortality, not just because of the risk of suicide, but also for association with increased rates of heart disease and cancer. Of course, those who suffer depression tend to take care of themselves less well; but even accounting for all these factors, there appears to be a substantial physiologic response to depression that predisposes depressed people to all the diseases of old age. Here is a meta-analysis concluding that people diagnosed with depression have an age-adjusted risk of dying that is 1.8 times as high as those who are not. In a paper last year, UCSF psychologists linked depression to lower social status. They theorized that oppressed people have bottled-up anger which it is objectively dangerous to express, so they learn to suffer quietly and depression is the price they pay. Some research has linked depression to accelerated aging through telomere shortening, though this is disputed. I have wondered about the evolutionary meaning of depression. What adaptive purpose could it serve to put us into a passive state, with deadened senses and a narrow range of emotional responses? Certainly depression is not good for individual survival or reproduction. My guess is that depression evolved as a way to make feudal social orders tolerable for the serfs. Depression is a response to powerlessness that prevents rebellion and promotes an imposed social cohesion. I assume that much of the natural selection on early humans was tribe-vs-tribe competition, and those tribes in which the peons were depressed and subservient were able to out-produce and to prevail in armed conflict against those tribes in which every individual was thinking independently. Your vocabulary word for the day is eudaimonic, an adjective that describes the feeling of happiness and well-being that is derived from engagement with a social mission. The contrary is hedonic happiness, which refers to success in pursuit of more selfish ends. A Florida research team looked at gene-expression profiles associated with inflammation and auto-immune responses that are associated with most of the pathologies of old age. Our genes don’t change through a lifetime, but the patterns of which genes are turned on and off show an age dependence. As we get older, inflammation and auto-immunity are part of a program of gradual self-destruction. The Florida team found a link between hedonic happiness and expression of these self-destructive gene patterns. Eudaimonic happiness had the opposite association, a link to younger, healthier gene expression profiles. It seems that virtue provides its own reward. I read the evolutionary context for this loud and clear: aging is a social adaptation, self-destruction whose purpose is to help keep the community stable and dynamically adaptive. Everyone must take his turn making this sacrifice, but the community does well to hold on longer to those who are contributing most to robust and cohesive social functions. But I notice that Steven Cole, the behavioral geneticist from UCLA who wrote up this work, tries to interpret his results in terms of individual benefit which mysteriously fails, rather than attributing to it a group selective purpose. “This response likely evolved to help the immune system counter the changing patterns of microbial threat that were ancestrally associated with changing socio-environmental conditions; these threats included bacterial infection from wounds caused by social conflict and an increased risk of viral infection associated with social contact,” said study senior author Prof Steven Cole of the University of California, Los Angeles. This attitude is all too common in a pattern stretching back to the 1970s when evolutionary scientists began imposing an ideological purity that excludes group selection. There is now a substantial minority of evolutionists who have taken a professional stance in support of group selection, but around the periphery of the field, few researchers are willing to pay the price of pushing back against this prejudice. Get out there and work, in cooperation with others, for a better world. Better yet, become a leader in progressive social movements. You’ll feel better and live longer. I am traveling in Europe this next week, and may not post anything. But the following week I will be at Aubrey de Grey’s SENS conference, Re-imagine Aging in Cambridge, and you’ll get a full report on Sept 8. Stay tuned also for a major update in September to my Aging Advice page. I would like to use some of this article, translate it and repost on my own blog if you it’s OK with you ? I will be waiting for your update ! Thanks for your support, Philippe. Please translate and re-post wherever you feel appropriate, with attribution and a link back to the original. I am still trying to imagine group survival of the fittest group compared with individual survival of the fittest individual. Let us assume two tribes go to war. Then the survival of the individual depends on the survival of his group. The individual may even be more fit than any individuals in the enemy group; but if his group looses, they all get slaughtered.